Three Strikes, Bright Angel Point, North Rim, Grand Canyon National Park: Grand Canyon’s summer monsoon storms tend to move south-to-north. The southern exposure of the North Rim’s Grand Canyon Lodge and Bright Angel Point provides a wonderful vantage point for the thunderstorms’ approach, and nearby cover when they get too close. Grand Canyon is as difficult to photograph as it is breathtaking. The canyon’s layered detail shrinks in a lens that’s wide enough to adequately convey its scale; its overwhelming scale is lost to a telephoto lens focused on its detail. Grand Canyon is really two worlds: the year-round, relatively accessible, always bustling South Rim, and the warm-month-only (mid-May through Thanksgiving), relatively remote, more peaceful North Rim. Separated by ten crow-flying miles, it’s a grueling, eighteen mile hike, and a scenic four hour drive between rims. The section of the Colorado River visible from the South Rim moves more or less east to west. Among the vista points with good views to the east, for sunrise and afternoon rainbows, are Grandview Point, Mather Point, Yaki Point, Powell Point, and Hopi Point. Vistas where you can photograph the setting sun and morning rainbows include Desert View, Navajo Point, Lipan Point, Yavapai Point, Hopi Point, and Pima Point. 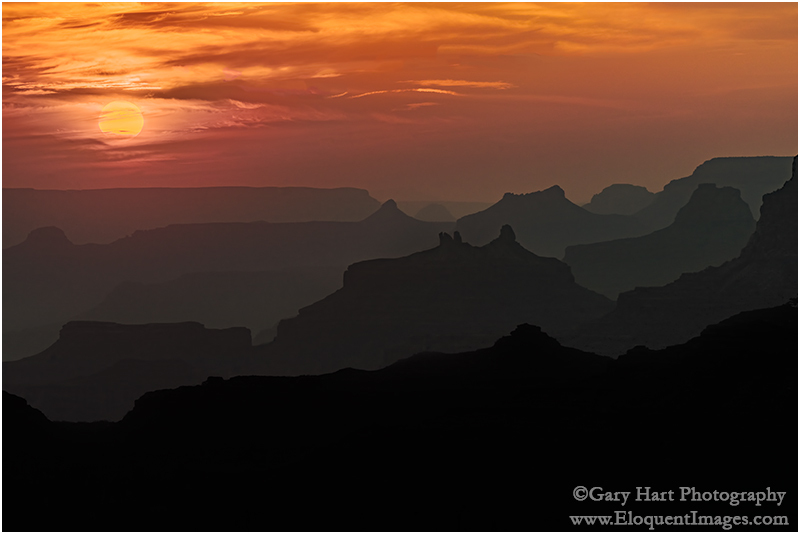 Sunset Silhouettes, Desert View, Grand Canyon: An extreme telephoto lens will compress Grand Canyon’s horizontally stacked ridges; composing toward the sun at sunrise or sunset will create silhouettes, and a hard-stop graduated neutral density filter will help retain sunrise/sunset color. Much of your South Rim success will be determined by your ability to anticipate and avoid tourists. The South Rim from Mather Point west, with it close proximity to park services (parking, hotels, restaurants, shops, camping) teems with tourists. Further west, the Hermit’s Rest Road shuttles (shuttle or handicap access only in summer) are also packed all summer. Mather Point is so crowded for sunrise and sunset that it’s usually best to avoid. But if you hit the snooze once too often and find yourself needing a sunrise location that doesn’t require a lot of effort before your first coffee, try the view from the rail near the amphitheater, just east of the packed Mather Point vista. Or better yet, park near Yavapai Point, about a mile west, and walk the rim toward Mather until you find a view that moves you. For a South Rim sunset, it’s hard to beat Hopi Point. With views in both directions, Hopi is well worth the Hermit’s Rest Road shuttle ride. But this fact isn’t lost on everyone else in the park, and you may just feel like they’ve all joined you. If you don’t want to deal with the crowd at Hopi, less crowded Hermits Rest Road options are Powell Point (a short walk from Hopi) for views to the north and east, and Pima Point for views north and west. Sunset, Hopi Point, Grand Canyon South Rim: Walking the canyon’s rim not only gets you away from the crowds hovering at the designated vista, it’s also the best way to find the trees, shrubs, and rocks that add depth to your images. The eastern vista points along Desert View Road (Highway 64)—Lipan Point, Navajo Point, and Desert View—tend to be a little less crowded, especially if you’re willing to explore a short distance from the designated vista. 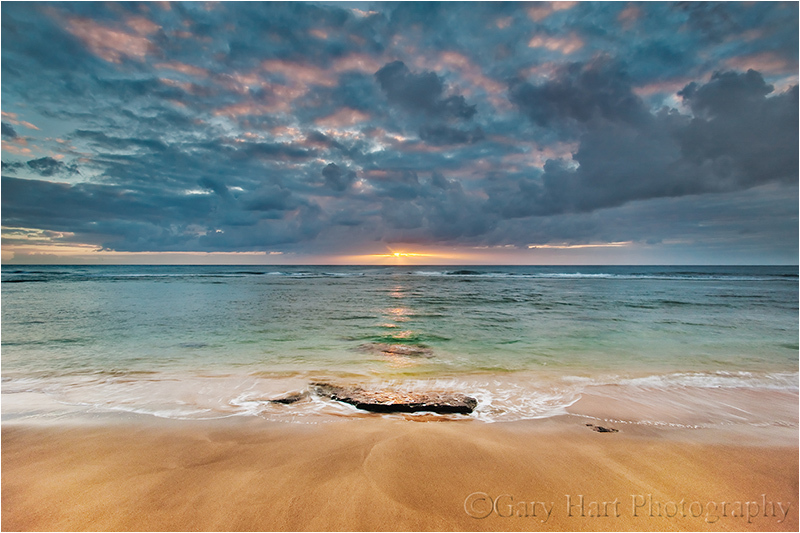 If I don’t have a specific objective other than to find a nice shot, this is where I go, especially for sunset. What makes these east-side vistas particularly appealing is their view of the ninety degree bend in the Colorado River. Near the bend you can look north, upriver, toward the Little Colorado River and Marble Canyon, and a great distance downriver to the west. This west view from any of the South Rim’s east-side vistas is the best place to break out the telephoto lens and compress the succession of ridges that recede into the distance. After spending a few days battling crowds on the South Rim, the relative peace of the North Rim is a welcome relief. This peace, and the variety of scenes, is why I consider the South Rim the tourists’ Grand Canyon, and the North Rim the photographer’s Grand Canyon. While South Rim photography is primarily about grand views, on the North Rim you can also find summer wildflowers and evergreen forests accented by groves of aspen that turn brilliant yellow in late September. 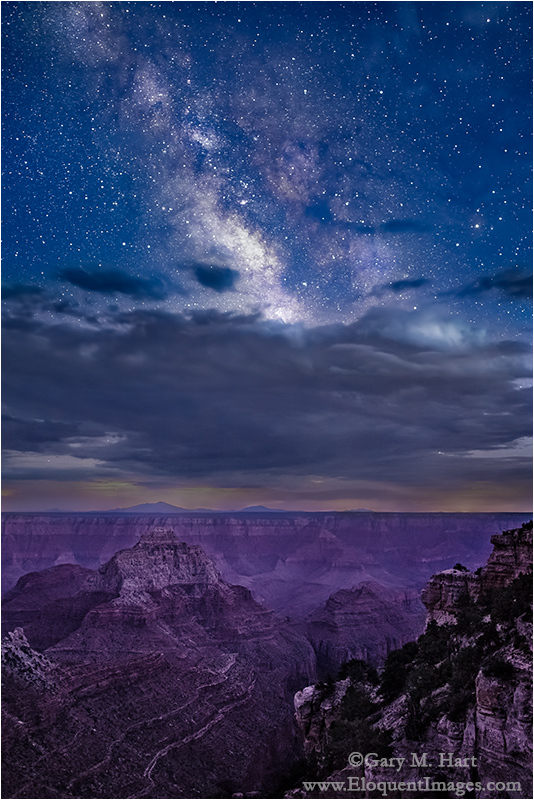 And its views to the south make the North Rim the best place to view approaching thunderstorms during the summer monsoon, and the glow of the Milky Way’s center on a dark summer night. For the best south and west views on the North Rim, check out Bright Angel Point and Cape Royal. Bright Angel is a five minute walk from North Rim Visitor Center and Grand Canyon Lodge (the North Rim’s only rim-side lodging). Cape Royal is about an hour from Grand Canyon lodge, at the end of Cape Royal Road, and an easy ten minute walk from the large parking lot there. While walking out to Cape Royal, if you’re not bothered by heights, make sure to take the short detour out to Angel’s Window. Angel’s View, Milky Way from Angel’s Window, Grand Canyon: Dark night skies and an open view of the southern horizon make the North Rim idea for summer Milky Way photography. Because the view from Grand Canyon Lodge and Bright Angel Point is partially washed out by light pollution from Grand Canyon Village on the South Rim, Cape Royal, Angel’s Window, and Walhalla Point are a better bet. The other easily accessed North Rim vistas look east, and are all accessible from the Cape Royal Road: Point Imperial (a personal favorite), Vista Encantada (too obstructed by shrubs for my taste), Roosevelt Point, and Walhalla Point. If you want to do a little exploring, you’ll find that just outside the National Park Boundary, the North Rim is crisscrossed by a network of unpaved National Forest Service roads (many navigable by passenger cars). While dusty, washboard fifty mile roundtrips aren’t for everyone, if you like rarely photographed, solitary canyon panoramas, these roads are well worth the effort. Caution: Your GPS can’t distinguish between the relatively navigable primary NFS roads and the narrow, often impassible side roads, so never attempt these roads without a prior visit to the North Rim Visitor Center for a detailed map and consultation with a ranger. 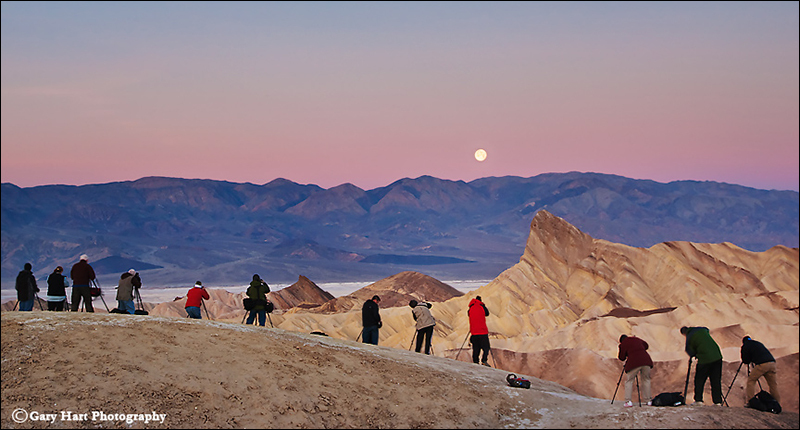 While wide angle shots are everywhere on the rim, it’s a mistake to leave your telephoto home. I used to think I’d be fine if I could cover focal ranges from 20mm to 200mm, but the more I visit, the more I appreciate the value of a long lens for isolating individual features at Grand Canyon. On my latest visit, nearly a quarter of my images were in the 200mm to 600mm range. A polarizer not only deepens the blue sky and enhances the clouds (especially for cross-canyon compositions), it also cuts some of the haze that frequently hangs below the rim, and enriches the Canyon’s predominant red and green hues. 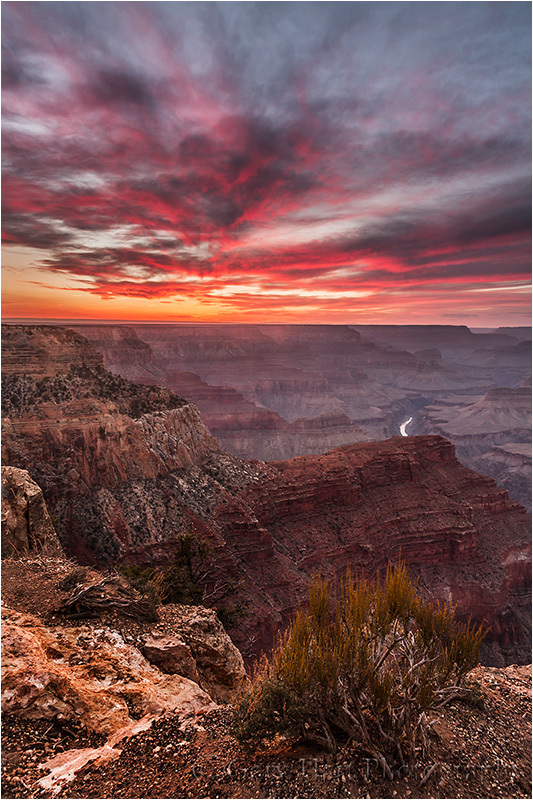 And despite continued improvement of today’s digital sensors, a graduated neutral density filter is invaluable for wringing every last stop of dynamic range from Grand Canyon’s high contrast sunrises and sunsets. The canyon’s flat horizon is ideally suited for hard-transition GND—I get the most use from my 3-stop hard and 3-stop reverse GND filters. Regardless of where you end up, arrive early enough to explore the rim nearby. In addition to a little more elbow room, you’ll likely find a foreground tree or shrub to accent and add depth to your composition. And most important, at each stop be sure to set your camera aside long enough to simply take in the view and appreciate that you’re witnessing one of the most beautiful scenes on Earth.